Jemima Jane Corlett: The village dressmaker. Dan Quilliam: A strong farmer. Agnes Quilliam: His daughter, the Chapel organist. Peggy Corlett: A schoolgirl, daughter to Jemima. Moirrey Mylroie: The Village schoolmistress. John Crellin: A Manx-American just returned home. The time of the play is modern – but it should not be forgotten that in small country villages old and new customs, speech and outlook are mingled to a great extent. The combined living and work room of the Corlett house, a cottage old in structure but fairly modern in furnishing, though with an old-fashioned dresser holding some fine china. Kitchen range, with a bright fire and kettle and teapot on the hob C.B. Window R, its deep sill strewn with pieces of material etc., and beside it a sewing-machine and small chair. Behind the chair a wall cupboard on top of which stand a small radio cabinet and a vase of flowers. On L of fireplace is another wall cupboard, a full-length one in which some food and dishes are kept, and just beyond it stands a wire “figure” with an almost finished dress on it. The dresser is L. and down L is a door to the back kitchen. Down R. near the window is another door leading to an entrance lobby, across which is the parlour, referred to as “the room.” There is an armchair at each side of the fire, and several small chairs about the room. A long table occupies the centre space, one end of it having dressmaker’s materials and partly finished garments on it, while the other bears a white tablecloth folded in half across it, and is partly set for a meal. Jemima Jane is seated at the machine, sewing busily, as the curtain rises. She pulls a bright blue dress away from the needle and snaps the thread, then shakes it out and lays it across the table beside her chair. JEMIMA: There! That’s Agnes Quilliam’s done, all to stitching in the buttons. Young Peggy can do that for me when she’ll come in from school, and then parcel it up and take it to the Ballachrink this evening. Shee bannee mee! The go that’s on them over the Anniversary – you’d think Trollaby was the only Chapel in the Island to be having one – and yonder Agnes the only person that can play an organ! There’ll be no holding her for a bit after she’ll be stuck up there playing for the Glen ones and that one from Douglas that’s going to sing solos, and them all asked for tea after that, it’s like, aye, and supper after, I wouldn’t trust. ‘Deed, Agnes must have been baking for days, and a couple of chickens boiled at her, so Kirry Quine was telling, and her put to pluck them and put the feathers in the oven to bake for cushions after the food was out. Aw well, thou’ll get leave! It’s their big day, right enough – and I suppose she’s deserving to be the big woman in that Chapel, too, for she’s very faithful at the organ, hardly away a Sunday through the year. It’s a real Kirk Lonan dip she’s got this time, though (holding the dress) I would say it’s a bit too bright for her, with that red face and red hair, and her size – but I suppose if it’s suiting her it’s right… Now, I must get Moirrey Mylroi’s cyclamen done next – there’s a lovely shade, now, and it’ll just suit her – like a fairy I always think she is, with her slight figure and them big greeny-grey eyes and hair the colour of moonlight on the sea – you’d never believe Moirrey was nearly thirty-five. Well, whoever’s going to be the last to get her Anniversary dress, I’ll see it’s not her, for a niver or more gennal person than the schoolmistress you wouldn’t find in the Island – and to tell the truth, I’ve never forgiven myself for letting her down over her boy that was going foreign. She must have thought a lot of him, too, for she’s never married, and she must have had chances – aw well, you never know what’s for you in this life, and ‘specially with the men! A knock at the outside door – she glances through the window. QUILLIAM (outside): Are you in, Mrs Corlett? JEMIMA: Aye! Come in, Master Quilliam, man. QUILLIAM: Is me daughter’s dress ready? I could take it up with me in the milk van, if it is. JEMIMA: Not quite, Master Quilliam. I’ve got a bit of finishing-off to do, and I’ll send it up this evening with Peggy. QUILLIAM (doubtfully): Well, I don’t know, she was saying she expected it last night, and I’m thinking she’ll be in a real canary-fit. Wanting to try it on before Sunday, she is, and see are there any alterations needed. JEMIMA: I don’t think there will be. She’s had two fittings, and I’ve made for her these years. QUILLIAM: Aye-aye. Well, whatever you say, Mistress. I’ll tell her it’ll be up this evening, then. We’re busy scandalous at the Ballachrink this week, so I’d best be making tracks. JEMIMA: Aye! I suppose you’re whitewashing and painting the gates and fixing the garden in all hurries for the Anniversary. Watch out now, that you’ll not do like Annie Kermode at the Ballaquine Anniversary – she went and painted the garden gate the night before, and it wasn’t dry when the Chapel ones came up for their tea, and some of them got paint all on their new clothes. QUILLIAM (laughing): Aw aye, I was hearing about that – I think all the parish heard about it – a real disgrace it was. I wouldn’t like a thing like that to happen at Trollaby, at all – but there’s no fear of us, for Agnes was putting a slick of green paint on ours yesterday, and this is only Friday. Well – so long! JEMIMA: Aye-aye! The father is well lanketed at her, it seems – I’ve seen the day when Dan Quilliam, wouldn’t have taken his orders from a woman; but I’m thinking Agnes is wearing the breeches all right since the mother went. Looking out for a man she is, too, and casting her eye on some Douglas fellow, I’m hearing – but I’ll pity the man that’ll get her, whoever he is. That one’ll be a real joushag by the time she’s forty. There is the sound of singing and running footsteps outside, and Peggy enters through the back kitchen. She is a girl of about twelve, dressed in High School uniform, and as she comes in she pulls off her beret and blazer and throws them and her school bag on to a chair. Peggy goes over to the range and takes out a plate piled with food which she sets down on the cloth at the end of the table, gets a loaf, breadknife and butter out of the cupboard and cuts some, then sits down to eat. JEMIMA: When you’re done there’s a little job for you – sewing on some buttons. PEGGY: O.K. – who’s it for? JEMIMA: Anges Quilliam, it’s her anniversary frock – that blue one. PEGGY (looking the dress over): H’m! Our Agnes is doing herself proud this year, isn’t she? But I’m thinking something a bit quieter would look better on her – she’s no chicken, and far too hefty for that bright blue. JEMIMA: Yes, I was thinking that myself. But it’s no concern of ours, if she’s satisfied with it. PEGGY: I suppose she’s thinking she’ll catch the eye of that Manx-American that’s stopping at the Harbour Inn – they say she’s invited him up for the Anniversary, and they’re thinking he will be up tonight, too, to help them put up the stages. JEMIMA: Aw, Agnes wouldn’t want to be going away to America at all. I hear she was courting some big singer from Douglas that won in the Guild. PEGGY: Well, you never know, Mum – chance is a fine thing, they’re saying! Anyway, the American might settle here – old Quilliam could do with a younger man to take some of the care off him, and the Ballachrink is a good farm. JEMIMA: Aw, I’m thinking a Manx farm wouldn’t be any attraction to one that’s been living in America – it’s a very different life out there, I’m hearing even the farm labourers are going to work in their own cars, and fine cars, too, far better than you’ll see here. Footsteps are heard outside, and there is another knock at the door as Jemima glances out of the window. JEMIMA: Bless and save us! If it isn’t the big woman herself that’s in! Get you agate of them buttons, Peggy child, the way she’ll see we’re working on her dress. (Raising her voice, as Peggy hurriedly seizes the dress, picks up a needle and thread and some buttons from the table, and sits down again to sew). Come in, Agnes one – your dress is nearly ready, and Peggy would have brought it up after – I’m sorry you’ve bothered to come down for it. While Jemima is speaking Anges Quilliam enters. She is a woman in the thirties, big and reddish-blond, dressed well, but rather showily, with a rather affected manner and a good deal of self-assurance. AGNES: Oh, thank you, Jemima Jane! I wasn’t really afraid you would let me down. Father said he would call for it, but then I thought maybe I’d better come myself and give it a last try-on, just to make sure it didn’t need any altering – not that I think it will, you know – but you see – (simpering) the Anniversary is such a very special occasion, especially this year, and myself right in the public eye, as you may say. JEMIMA: Aye one, you’re well seen, sitting up yonder at the organ. Well, the dress is ready, or it will be in another minute or two, and then you can go in the room and put it on if you want. PEGGY: I’ve only two more buttons to sew on, then it’ll be ready. AGNES: Thank you Peggy! What an industrious little daughter you have, Jemima Jane – she must be quite a help to you. I like to see a girl helping her mother, and it’s the best way for her to learn the things she’ll need to know when she has a home of her own. I’ve been thankful many a time that Mother trained me so well. JEMIMA: Aw, she’s got to work, like the rest of us, but I don’t put on her too much. AGNES: As I was saying, it’s a very special Anniversary with us this year, for we’ll have a Homecomer at the services, just come from America. JEMIMA: Aw aye, I was hearing about him staying at the Harbour Inn – one of the Crellins, isn’t he? AGNES: Yes – John, and we’ve seen quite a bit of him in the few days he’s been here – we were always very good friends, you know, before he went to America, and he was reminding father only last night that it was the very day after the Trollaby Anniversary that he left, fifteen years ago. JEMIMA: Aw, I remember John very well, and he was always thick with your Daa. He must have done well out yonder, to be able to take a trip home – or has he come back for good, maybe? AGNES (with a slightly embarrassed laugh): Well, I don’t think I am telling tales out of school if I say that you are right about that. As a matter of fact, he came up first to consult Father about buying a place to settle, and when he heard the Ballamoar was going, nothing would do but he must have that. JEMIMA: Is he going to farm, then? AGNES: I don’t know yet. He might, or maybe Father will take over the land from him – there’s nothing really settled – but I’ve got a good notion what’s in his mind (looking very conscious). He wanted to stay at the Ballachrink, but he’s a bit sensitive-like – doesn’t want to give trouble, he says – and I’m thinking he’s afraid there might be talk, you know. JEMIMA: And I’m sure he wouldn’t want that. AGNES: Well, no – not premature, anyway, I don’t think. PEGGY (rising, breaking off thread and holding out dress): There you are, Miss Quilliam – it’s ready. AGNES: Thank you, dear! (Takes dress and looks it over). It looks very nice, Jemima Jane, but I think I will just go in and put it on – for safety, like. Exit Agnes. The door to the parlour is heard firmly closing. PEGGY: Aye – I’m thinking she’s got her eye on him, all right! JEMIMA: Sh-sh! But it takes two to make a bargain, and if I remember him right, John Crellin is a downy customer, and it’ll be hard to lanket him. Heavy footsteps are heard coming in through the back kitchen, then the sound of water splashing. Peggy moves her plate away and sets in its place a cup, saucer and plate from the dresser cupboard. Jemima also rises, puts more water on the teapot and pours out a cup, while Peggy sets a plate of cheese, a dish of jam and another of cake on the table, and cuts some thick slices of bread and butter. Jem appears at the back kitchen door in his shirt-sleeves, his arms bare to the elbow, drying himself on a towel. JEM: Still at the stitching, are thou, girl? It’s a good thing this Anniversary only comes once a year! And what all these women is wanting with so many new clothes is beating me, and plenty of them never worn, hardly. PEGGY: T’t! Daddy! Come on and get your tea, now. (Jem throws the towel into the back kitchen behind him and comes forward, drawing up a chair and sitting to the table, where he starts to eat, stirring his tea, etc.) Of course we’re all wanting new frocks for the Anniversary, and most of us going on the stages and all. You wouldn’t want the Trollaby ones to be making a poor show before all them grand singers from Douglas, now, would you? And even one from America coming to look at us, I’m hearing. JEM: Aye – John Crellin you’re meaning, I suppose? I was hearing a bit of news about him, too, ‘Mima. JEM: It’s all the talk that the Ballamoar is bought back at him, and he’s got a tractor and all sorts of new machinery coming, and going in for a special breed of pedigree cattle, tuberculin-tested and all. JEMIMA: He’s going to settle on the old Crellin farm, then? JEM: It looks like it, anyway. Dear me! There’ll be great go on the girls when it gets out – they’ll all be thinking he’ll be looking out for a wife next, and him with the farm on his hands. PEGGY: Well, we know one that’ll be after him, don’t we, Mum? JEMIMA: Hold your hush, girl! Have a bit of sense, now, do! Jemima nods and gestures towards the parlour. JEM: Hey, what’s all this? JEMIMA (lowering her voice): Aw, it’s just a notion the child’s got, because Agnes Quilliam came in looking for her new dress and talking about him being up at the Ballachrink – but John was always thick with old Quilliam before he went away, and I don’t suppose there’s anything in it. JEM (chuckling): Well, he’d not need to crack a match to see that one in the dark, like the man did when he went to buy the heifer! JEMIMA (hurriedly): Whist la! She’s in the room trying on her dress, and she might hear you. JEM: H’m! Is that so? Well, you know what they say about listeners. (He looks out of window). It seems we’re getting lots of visitors this evening – here’s the very man we were speaking of himself – and by the Powers, he’s got the schoolmistress with him! Now – wasn’t there some talk of them two going together before he went away? Nobody answers him, for there is another knock on the door, and John Crellin and Moirrey Mylroi enter, arm-in-arm. JOHN: Hullo, Jem – you’ve got down before me, I see. Well, Jemima, you look just the same – but you’ve beaten me: you’ve got something nice to show for the years I’ve been away. John smiles at Peggy, who smiles back shyly. Jemima rises and shakes hands. JEMIMA: ‘Deed, and it’s a sight for sore eyes to be looking on your face again, Juan Beg – though I shouldn’t be calling you that now, and you the Ballamoar, as I’m just hearing. Anyway, I’m mighty glad to be putting the Shee-dy-vea on thee, John Crellin, and I hope thou’ll do well in the old place. JOHN: Thank thee, mistress! It’s glad I am to be back home, too – America’s a grand country, but there’s no folks like your own, and the Island will ever have a pull on a Manxman, I’m thinking. JEMIMA: Well, soie sheese now, and make yourself at home. And take you a chair, too, Moirrey – you’re no stranger – and the two of you will stay and have some tea with us – you can’t say no, and this the first time John has crossed this door for fifteen years. MOIRREY: Thanks, Jemima, we’ll be very glad, I’m sure. (They seat themselves). Well, Peggy – how do you like going to school in Douglas? PEGGY: I didn’t like it at all the first week, Miss Mylroi, it all felt so strange, but I’m getting used to it now. I’d rather be at your school though. MOIRREY: Oh well, we all have to go on as we get older, you know, and I’m sure you will like it when you get really settled in, and perhaps get into the hockey team, and things like that. Anyway, I’ll not be at the old school much longer. JEMIMA: You’re not going to leave us, Moirrey? The parlour door is heard opening and shutting, then Agnes Quilliam appears in the doorway, carrying the dress over her arm. AGNES: Mercy me, Jemima Jane, you have got a houseful! I thought I heard voices. (She goes to John Crellin and touches his arm possessively). You here, John? Oh, of course – I forgot – you knew Jemima very well at one time, didn’t you? Jemmy, too, of course – his father used to work at the Ballamoar, I remember. Well, I suppose you will want to look up all your old friends, after being away so long – but I think so many of us are rather crowding these good people just now. You will be after your Anniversary dress too, I’m thinking, Miss Mylroi – I hope you’ll be as lucky as me! (She holds out dress). It’s all right, Jemima Jane, it fits very well so if you can find me a big piece of paper I’ll wrap it up and take it with me, and save Peggy coming up. JEM: Fit – fit! It’s beating Bannaghan, the sthoo that’s on you women about fit! What fit is there at you? Shelter’s what you want, as the old tailor said. AGNES (laughing indulgently): Well – perhaps that was the main idea one time, but some of us want a bit more than shelter now-a-days, Jemmy, as your wife knows very well. MOIRREY: And we get it, from Jemima – I’ve never had a bad fit from her yet. JEMIMA (sweeping her a half-mocking curtsey): Oh – gur-eh-mie-ayd, Voirrey! (With a meaning glance at Agnes). I wish all my customers were as kind as you! AGNES: Well – I must be making tracks, Are you coming, John? I think Father will be expecting you up to supper. JOHN (a little embarrassed): Well, I don’t think we’ll be coming just yet, Agnes. We’ve got a little bit of business to talk over. I’ll not be up at the Ballachrink to-night, tell your Father, but I’ll be seeing you both at the Anniversary on Sunday, for certain. And now, before you go, I want to tell you some news. (He rises and goes to stand by Moirrey’s chair, placing a hand on her shoulder). I think you all know that Moirrey here was my girl frend before I went away – well, we’ve been writing to each other this while back, and now she’s done me the honour to say she’ll marry me. We’re going to settle at the Ballamoar, and I hope you’ll all come to the wedding next month – we’ll be sending invitations to all the neighbours, and we’ll always be glad to welcome them to our home. MOIRREY: And I want you to make my wedding dress, Jemima – that’s really what we came about this evening. PEGGY (running over and kissing her): Oh, Hooray! You’ll make a lovely bride, Miss Mylroi, and all the school children will come and dance at your wedding. All rise and shake hands with John and Moirrey, with laughter and congratulations. Agnes stands aside for a moment with a mortified expression, then decides to make the best of it and joins in the congratulations – but cannot resist a final dig. AGNES: Well – what a surprise! I’m sure I hope you’ll both be very happy – and if you want any advice about cooking or poultry or butter-making or anything, Moirrey, you can always come to me. But I don’t know how you’re going to turn a school teacher into a farmer’s wife, John! JOHN: Aw – she’ll learn. JEM: Well, well! And so thou have come to be lanketted for all, boy! JOHN: And maybe it’s Herself will be the one that’s lanketted – you never know. (Moirrey looks at him in mock indignation). We’ll just have to let with and take of it, whatever will come, as the saying is, once the knot is tied. But I’m thinking, someway, it’ll not be a lanket for one or the other, but just double harness, the two of us taking our share at pulling and happy together like a good team. JEMIMA: Well, Voirrey, I’ll do my best to make your wedding dress the best one I ever turned out – and I’ll have your anniversary frock ready for to-morrow, too, though you’ve never worried me about it – not like some ones. But you’ll be wanting to look your best on Sunday, for by then all the parish will know about the wedding. AGNES (rather sarcastically): Maybe I’d better play the Wedding March for a voluntary! JEMIMA: Aw no, I wouldn’t do that – you were saying yourself, just now there, that John Crellin wouldn’t want anything premature! But it will really be Moirrey’s Anniversary this year, I’m thinking. JOHN (putting his arm round Moirrey proudly, both of them smiling): Our anniversary! * The original manuscript has “over” at the end of the sentence here. America’s a grand country, but there’s no folks like your own, and the Island will ever have a pull on a Manxman, I’m thinking. The play was first performed at the Guild in 1958, by The Phoenix Players, where it received negative reviews from the judges on the night. This was undoubtedly part of why The Anniversary has been effectively forgotten about since then, but reading it now shows that the play is far better than the reviews would have us believe. 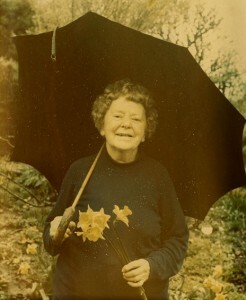 Mona Douglas was the main driving force behind the modern revival of Manx culture; we owe to her the existence of Yn Chruinnaght, the survival of Manx dancing, many of the Manx songs popular today and a body of poems, plays and novels that form an essential part of the Island’s literary heritage.